so in best case guys for end game we should aim for abadoned crafted items to come over 75 max block with gladiator? Can you recommend any SU/Sacred items for the late game that could replace some of the TU's? Is Mount Arreat set worth trying? 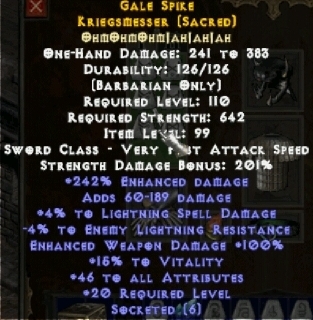 Jakkt wrote: Can you recommend any SU/Sacred items for the late game that could replace some of the TU's? whats endgame gear? can you farm duncraig/fauzt ? im using current qaraks will its awesome best in slot! i just found that one..... freaking awesome but its also for lvl 120 so rlly kinda end game i think. I have a question: I made this weapon with Ornate shrine i believe. Now i want to bless it but which shrine should i use for blessing it ? I used weird shrine but that was a mistake since it turns out crafted weapons like this cant get over 200% enhanced dmg so it added like only 10% dmg.